Can you tell I'm having fun with my new toy?? I ordered some of the Silhouette sewable interfacing so I am hoping to have a fabric craft done soon. I am also working on a quilt for a friend and will probably start posting a few pics of my progress (so she doesn't wonder what is up with her quilt). Last week I wanted to try making a card using Silhouette's Studio software to cut from, but using an SVG file. So I picked out a design from the Lettering Delights Spring-a-ling set. I opened it in Inkscape, did a path/object to path (this seems to make it work better), and then saved as a dxf file. Then I opened it in Studio and went from there to resize. Then I made a shaped card base by doing an offset on the flowers and added a rectangle to the bottom. I duplicated the shape, mirrored it, aligned the two sides, and welded them to make the base. Then I cut all the pieces out with the Silhouette. 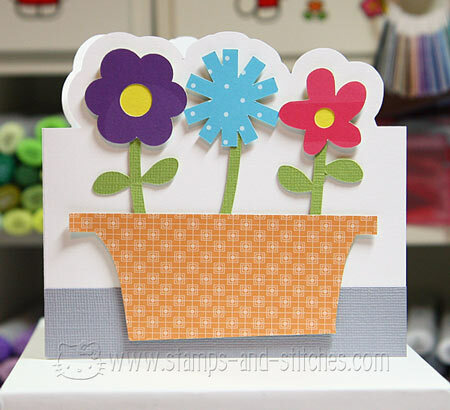 I used Paper Trey Ink cardstock for the card base, Stampin' Up patterned paper for the flowerpot, Lasting Impressions and Stampin' Up patterned paper for the flowers, Bazzill cardstock for the stems and Stampin' Up cardstock for the flower centers. The gray on the bottom is Bazzill cardstock I cut in a strip (with my paper trimmer). 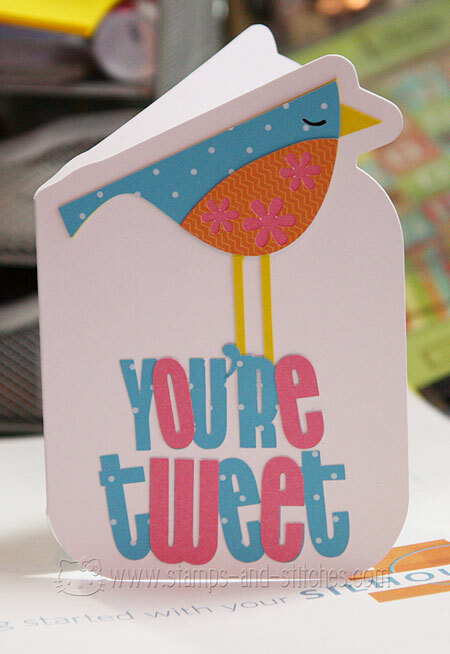 I am loving the shaped cards and they're so easy to make in Make-the-Cut or Studio software. On this next card, I wanted to try out the Silhouette's print and cut feature. So I found a graphic I liked from the Lettering Delights Harajuku Girls set and used the Studio software to print it and then cut it out with the Silhouette. My first try was about a millimeter off. I don't know what I did wrong but the second try was a success! I used Make-the-Cut to cut out the letters from a font called Mouseyer (I don't think the Studio software has the ability to load a font that isn't installed) and I also used it to cut the pink oval. Card base and oval are Stampin' Up cardstock. The letters and background paper are KI Memories patterned paper and the design is printed on and cut from Neenah Classic Crest cardstock. When I showed this to my 13 year old daughter, she got that look in her eye. I think she's already decided to give this to her teacher or one of her friends. Looks like I'm really into birds these days! The next card I post will not have a bird. I promise. This card was made from some graphics by Nancy Kubo which I separated and traced using Photoshop Elements and Make-the-Cut. I cut it out with my brand spankin' new Silhouette SD. Paper is all from Stampin' Up and Bazzill. I decided to upgrade from my Cricut to a Silhouette SD. It arrived yesterday so I got it all set up to work with Make-the-Cut and today I made this little shaped card. 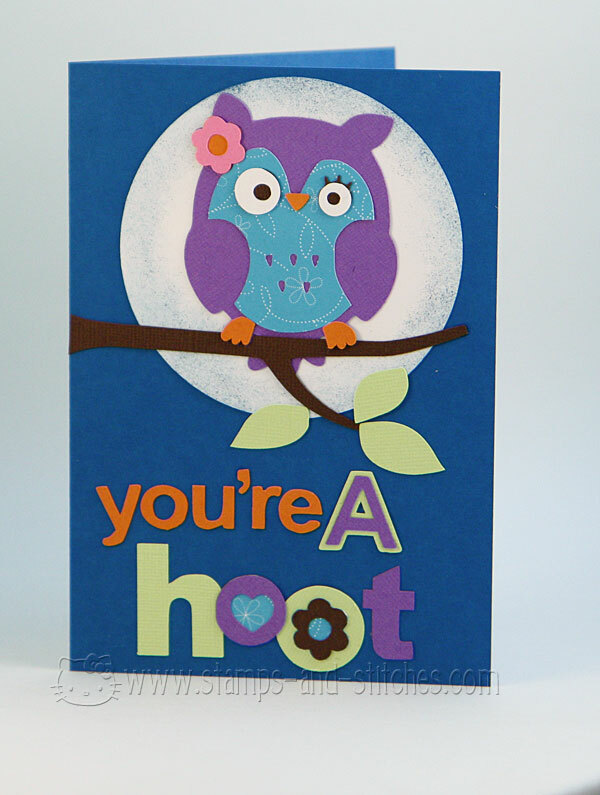 I used tutorials from my friend Jin's website, underacherrytree.com, to make the shaped card base and used svg files from Lettering Delights to cut out the images. The bird is from the Twitter Park svg set and the letters are from the Sweet Nothings set. There isn't a "you're" in the set, so I combined images to make it and used an apostrophe from a regular font. The silhouette cut like a champ once I got the hang of it (I have a cold so it took me longer than normal. That's my excuse, anyway)! 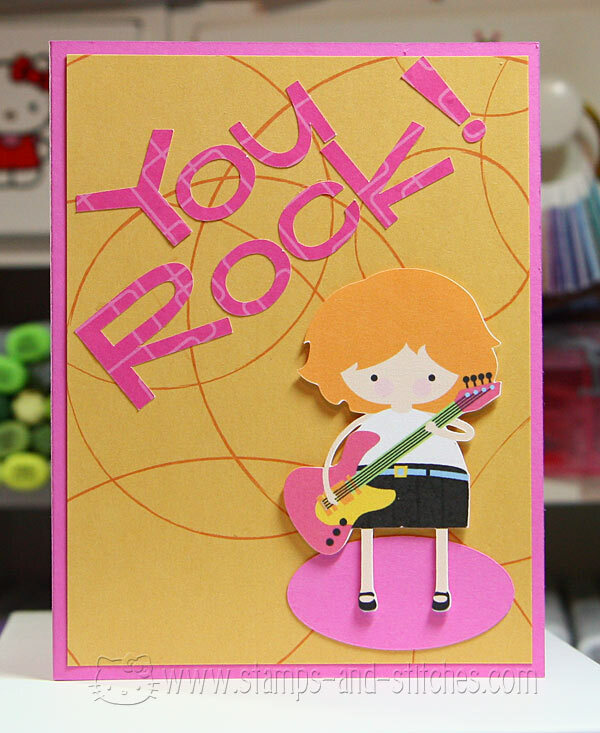 The card base is Paper Trey Ink 110# cardstock and the rest of the papers are from Stampin' Up. Everything cut easily with just one pass of the cutter (something I was concerned about but had no reason to be-while I was "learning" I cut clear through my mat somehow). Even the intricate parts, like the flowers on the wing, cut perfectly. I am very happy with the Silhouette so far!